Young pigs have a tremendous potential for growth. However, weaning represents a significant challenge to every pig and the success of this process is crucial to the lifetime performance of the pig. There are many factors that affect the success of the pig post-weaning including health, management and environment however, nursery nutrition plays a key role. High feed intake post-weaning promotes growth and health during the entire grow-finish period. Pigs that consume 100 g extra feed per day during the first week post-weaning are 1.5 kg heavier towards the end of the nursery phase. It is well known that 1 kg of extra weight out of the nursery translates into an extra 2–4 kg at slaughter. That’s up to 5 days faster to market. Feeding Purina’s PigTech Nursery program ensures your pigs get off to a good start, maximizing intake and growth early on. With today’s feed costs, good performance in the nursery means better gain and fewer days to market, the end result is a better bottom line. Feed intake post-weaning promotes growth and health during the entire grow-finish period. 1 kg more weight out of the nursery equals an extra 2–4 kg to slaughter, that’s up to 5 days faster to market. Purina has a history of delivering performance in nursery feeds, and with our PigTech Nursery program, that’s exactly what we do. Designed to meet the needs of young pigs from as soon as they take their first mouthful of creep feed, our recommended PigTech program will get your pigs through the nursery with strong performance and optimal cost/kg gain. Purina’s PigTech products are formulated around highly digestible protein sources with readily available carbohydrates and customized fat blends. Our nutrition is focused not only on stimulating feed intake and gut development, but delivering nutrients to help maintain an optimum gut micro-flora balance in the young pig. 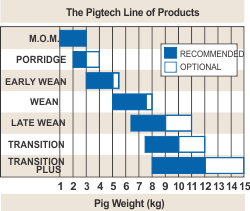 Check out our PigTech line up and talk to your Purina Swine Consultant about recommending a complete nursery feed program that best meets your needs.